Secret Service is yet another rogue anti-spyware application. This program states that it has been designed to protect, but that is compeltely FALSE! Secret Service is a complete scam! In fact, Secret Service was designed with the sole prupose of ripping unsuspecting comptuer users off! Secret Service makes its way from PC to PC via Trojan infections and via misleading advertising on dubious websites - across the internet. Once this corrupt software infects a computer it will display all sorts of security warnings, threat alerts and scan results that are all fake. 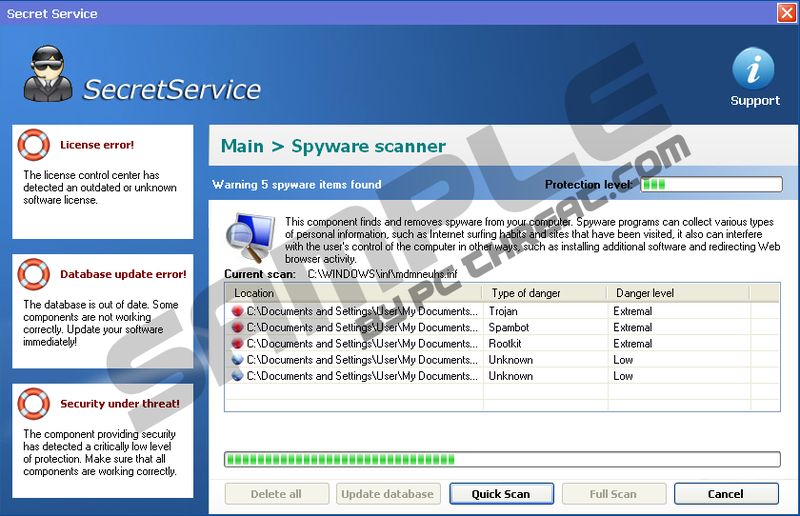 These fake warnings are designed to make you, the user, freak out and purchase the full version of the software - in an attempt to franticly clean and rid your PC of all unwanted activity. Unfortunately it‘s all a scam! Secret Service is a useless tool for comptuer users, btu a wodnerful tool for hackers! it does NOT clean infections from computers and it does NOT protect against future infections. Do not trust Secret Service, it's a SCAM! Quick & tested solution for Secret Service removal.